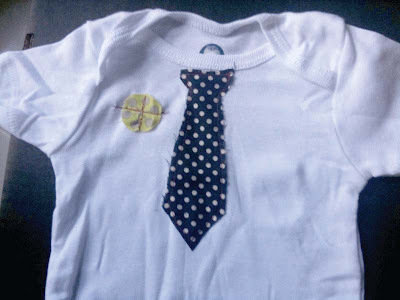 I Was trying to recreate the little gentle man onesies for the craft fair coming up but i decided to use dots instead of stripes and for some reason now they look like little hobo outfits to me. But that's ok, you can dress your baby like a hobo and everyone will still think hes cute! So look for these at the craft fair or special order one from me! Hahahah - He will just need one of those handkerchief bags on a stick! Awesome. haha i know! i was thinking about making a couple of them just for presentation at the fair.